The headline number in today’s jobs report from the Commerce Department was a pleasant surprise. 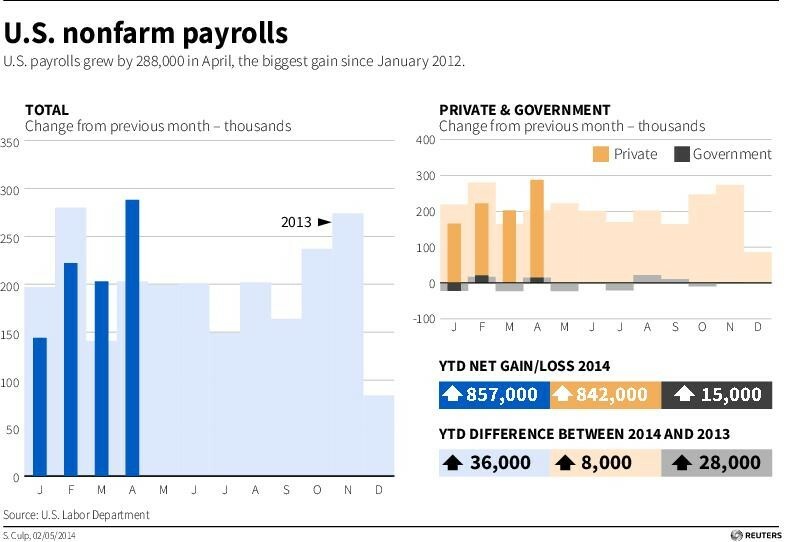 The monthly survey of businesses showed an increase of 288,000 jobs in April, a number well above expectations. But it didn’t take long for other elements of the report to throw the debate into confusion. The survey of households showed not a gain in jobs, but a decline of 73,000. The unemployment rate plunged from 6.7 percent to 6.3 percent, but the labor force participation rate dropped to its lowest level in nearly more than 30 years. Economists and analysts rushed to offer explanations for the mixed bag of information, but one element of the report was unambiguous: the plight of the long-term unemployed in the U.S. remains a huge and intractable problem. The April data show there were nearly 3.5 million American workers who had been unemployed for 27 weeks or more, down only a fraction from the previous month. That means more than 35 percent of the unemployed have been jobless for six months or more. It also means that 2.2 percent of the workforce consists of the long-term jobless. That’s actually down 0.2 percent from March, but is still painfully high by historical standards. Except in the immediate aftermath of recessions, that number has remained below 1 percent since the 1950s. Supporters of a renewal of a federal extension of unemployment insurance said that the persistently high level of long-term unemployment is evidence that the Emergency Unemployment Compensation program is needed. The program, which expired in December, supplements state-level unemployment benefits. State benefits typically expire after 26 weeks, meaning that anyone classified as long-term unemployed by the Commerce Department has exhausted them. Estimates suggest that 2.8 million people have lost benefits. During periods of extended high unemployment, the federal government has typically stepped in with an extension of benefits. They were, at one point during the Great Recession, extended to 99 weeks. Republicans in the House and Senate have generally opposed a renewal of the extension, though a handful of them joined Democrats in the Senate to break a months-long series of GOP filibusters and pass a five month extension that would include retroactive payments to jobless workers. Speaker of the House of Representatives, John Boehner (R-OH) has refused to bring the Senate bill to the floor for a vote, claiming that it does not do enough to create jobs. However, Boehner has not offered an alternative bill, and House leadership has not been willing to consider alternative legislation introduced by members of their own party. Jason Furman, Chairman of the White House Council of Economic Advisers, noted on the White House blog that the long-term unemployed tend to have educational and demographic backgrounds similar to those who are employed, suggesting that the problem isn’t lack of skills or other factors. Furman added that the CEA estimates that the refusal to renew the extension has actually cost the economy jobs. Many other economists agreed with Furman. In a statement about the jobs report, Speaker Boehner noted that the economy is still not producing enough jobs for all the unemployed, but made no mention of an unemployment insurance extension. “Earlier this week, we learned that economic growth largely stalled at the start of the year,” Boehner said in a statement. ”And while it’s welcome news that more of our friends and neighbors found work in the past month, this report also indicates more than 800,000 Americans left the workforce last month, which is troubling. We need more robust economic growth if we’re going to help the millions who remain unemployed get back on their feet.